The unicorn in this tapestry scene "Licorne Captive II" is captivated in a pen among the forest. The unicorn is a mysterious creature pursued by royalty in historic legends. The Hunt of the Unicorn is a series of seven tapestries showing the progression of life, death and reincarnation of the unicorn. Here we see the elusive and beautiful unicorn captured by hunters in the forest and is the scene before the resurrection or rebirth of the unicorn in a work full of wonderful beauty and detail. 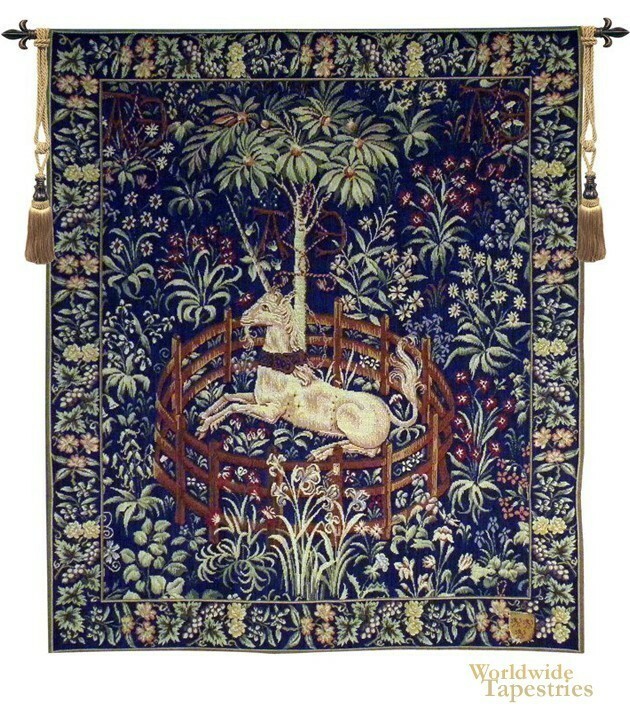 This tapestry "Licorne Captive II" is backed with lining and tunnel for easy hanging. Note: tapestry rod and tassels, where pictured, are purchased separately. Dimensions: W 30" x H 37"